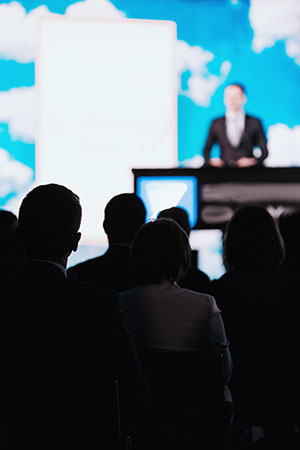 Based on continually updated research into best practice this globally renowned one or two day seminar provides experienced presenters with a range of strategies, tactics and skills designed to keep you well ahead of the game. Going way beyond traditional speaking techniques, the seminar develops your existing skill set using material based on research into the behaviour of top flight presenters and communicators and the reactions of audiences large and small. It will provide you with advanced level skills and techniques to construct and deliver successful presentations, either persuasive or informative, in both formal and informal situations. A method of presenting based on top-flight presenters. How to construct a presentation using that method. How to use that method to analyse your performance. Persuasive and informative strategies and tactics. Message sequencing for maximum effect. Impact formats for text and graphic visuals. Choice of media format from booklets to light shows. How to further develop your delivery techniques. The dynamics and how to respond in Q&A. How to deal with problems in Q&A. How to work effectively as a presentation team. A common language for use within your organisation. Senior managers and directors who need to present to their internal team and external clients.